Most of my canning jars I have were passed down to my by my grandmother’s, so every time I use them I think about all of the women in my family that canned before me. Most of them are the regular old canning jars, but I have a dozen and half of the wire bail jars that I use. They are quite lovely and every time I pull them out I feel a connection to the past. Were any of the canning jars in your collection passed down to you from family members? I’ve never been one to celebrate New Year’s as a way to make life changes. I’m a firm believer that those changes can come at any time and shouldn’t be put off until the first of next year. That being the case, I find it thoroughly ironic that since I’ve returned home from the holiday celebrations I’ve not done much other than purge my house and life of un-needed, excessive, or un-wanted items and activities. With all of the activities in my life (and the need to stay sane) I’m doing what I can to make life simple. Notice I didn’t say convenient. My daughter, Hubby, and I have rid ourselves of easily a 10×10 roomful of long unused items and an automobile (aka “The Hotrod”). We’re considering selling my little motorcycle since I haven’t ridden it nearly as much as my brother-in-law has. We’re making plans to convert our kitchen back into a full-blown kitchen rather than an eat-in chicken. We’ll get rid of our computer desks and our computers and switch over to laptops, thereby freeing up our office and returning it back to its intended purpose as a dining room. We’ve donated 3 large boxes of books and videotapes to the library. We’ve sold DVDs and CDs. I’ve also been purging some unhealthy lifestyle activities from my system lately. I limit how much time I spend in front of the computer and the television. I’ve started working out again. One of my gifts was a Kindle, and I’m thrilled at the number of trees I’ll be saving. I’m also thrilled at the prospect of reading all of those classics I trudged through in high school and college once again, but this time for enjoyment purposes – and for free. We’ve even downloaded some “living books” for homeschooling. I think the Kid has had almost as much enjoyment out of the Kindle as I have. I’m tired of cleaning all the time. I’m tired of having to move stuff out of the way just to clean other stuff. I’m tired of having to shut the spare room door because I can’t find room to store all the things we’ve accumulated. I’m tired of having boxes of stuff that I don’t even know what is being stored because we have so many dang boxes of stuff from our grandparents, our childhood, and stuff we’ve just kept! I’m tired of having to trash one room just to clean out another. So – what does this bring me to? Conveniently enough, a good friend of mine, Xan, all the way back up in Chicago is hosting a challenge this month: NoBuyFebruary. One that you can bet I will be joining even though I am limiting my electronic time. For the month of February she is challenging that we don’t buy a thing that we don’t absolutely need. Seriously. Americans are renowned for all the crap that we have. We have stores dedicated to Crap (with a capital “C”). Most grocery stores carry Crap toward the center of the buildings, and for that matter, so do many Big Box Stores. All that stuff by the checkout line – CRAP. The stuff at eye level, yep usually Crap. Ask yourself, do you really need that magazine? Do you need yet another flavor of lip gloss or Chapstick? Will you absolutely die if you don’t take advantage of the white sale? How many Persian cat figurines or bobble heads must you have? Why keep buying stuff if you don’t need it? Oh, I’m so guilty of this too, trust me (why do you think I’ve gotten rid of so much stuff, given it’s 15 years of accumulated Crap). My Kindle is a month old, already full of free books that will take me months to read, and yet I actually bought a book the other night. Our hallway is decked in a collection of handmade and imported masks and I still find myself browsing through those at art stores. I bought a mini-evergreen as a Christmas tree because it was only $5.00 and I was too lazy to get our artificial out. I’m not allowed to go near candles nor yarn until I use up my stores. I almost asked for the $250 KitchenAid Pro (ON SALE!!!) for Christmas just in case my smaller model broke within the next year or so…. Here I am at Pier 1 eyeballing a new set of dishes because the cheap set I asked for and received 2 years ago is starting to chip already. 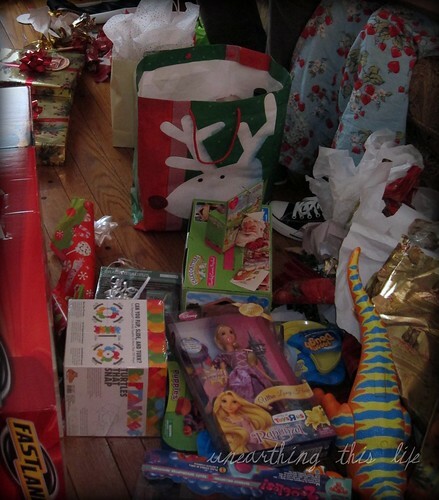 We have been trained as consumers to become hoarders… to compete with the neighbors to have the biggest inflatable holiday decorations, the nicest car, the best patio equipment, the rockingest entertainment center, the newest computer equipment. All of which will be outdated within a couple of years and be considered …. you guessed it. And where does it all go when we’re done with it? Yep, the trash. And when 311,958,838 people throw out their Crap they run and get more, and in two more years that Crap will be replaced and so on. So, do you think you can manage one measly month – 4 weeks – 28 days – and not purchase one thing except those things necessary for survival? Can you get by using the stuff you already have in your home? Can you imagine how much money you will save as a household? Can you imagine how little trash you will have? If you went one step further, if you cleaned the “Crap” out of one room, how much trash would you have from that one room? Please be sure to stop by and visit Xan at her blog and sign up for her challenge if you’re up for it. I think it would be interesting to keep track of your usual expenditures and see how much money you think you save this coming month. While Xan is not a normal writer for this blog (none of us are dabbling in normal after all), she is a regular visitor here and challenges my way of thinking often. Even if you don’t join us, at least give a second thought the next time you go shopping whether or not everything you need in your cart is a necessity or a frivolity. Here at Chiot’s Run I start all of my vegetables and many of my herbs and plants from seed. I do this not only to save money, but because enjoy doing it. It’s a great way to help get through those long cold dark winter months here in NE Ohio. I also enjoy the wonder that comes from seeing tiny seeds grow into big beautiful plants. Another reason I grow everything from seed myself is because I want to know what goes into my food. There isn’t an organic greenhouse around here from which I can purchase organic seedlings. That means that the ones I buy are coated with chemical fertilizers and insecticides, which is not OK with me when it comes to my food, or any other plants in my garden. Last spring I did a Seed Starting 101 Series on my blog with ten in depth posts dealing with the different aspects of seed starting. I won’t re-post them here because the comment section of each post is filled with fabulous information from other seasoned gardeners. If you have never done it and are looking to give it a whirl head on over and read through this series. If you start all you plants from seed and are an expert head on over and add some advice to the comment section. I’m also giving away 3 packs of Renee’s Garden Seeds on my blog, head on over there and comment on this post to enter this drawing (contest ends midnight 1.27.11). It’s a great way to get into seed starting if you’ve never tried it. Do you start your own plants from seed? Here at Chiot’s Run we feed the birds throughout the winter. We also provide a heated birdbath for our feathered friends. We really enjoy watching the birds all winter long. We’ve noticed that after we started feeding them we have more birds throughout our gardens in the summer months, and they really help with pest control. During the summer we feed the hummingbirds and enjoy seeing them buzzing about the gardens. Recently we’ve been noticing that at 10 every morning the blue birds come to our birdbath for a drink, I must buy some meal worms for them. Do you feed the birds in your gardens? 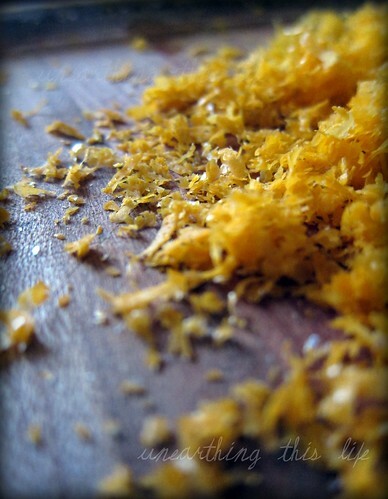 If there’s one thing I relish this time of year it’s Meyer Lemons. While 99 percent of our citrus comes from Florida, Meyer lemons are my one of my few exceptions to my California produce avoidance. Florida is so much closer to us, but the flavor and the … MMMmmm … SMELL … of Meyer lemons is magnificent compared to any of the other available citrus. If I can’t find them from Florida, I won’t give a second thought to purchasing California grown Meyers. 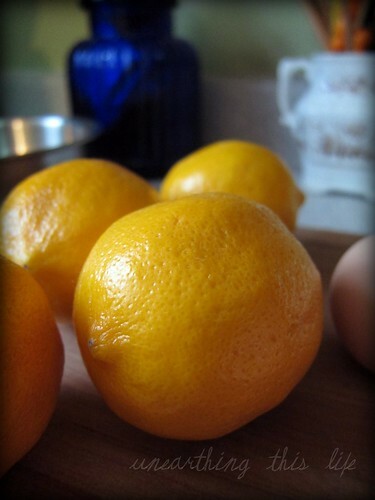 Meyer lemons in January = happiness. They are a guaranteed cure for the winter blahs. Their golden peels are little mirrors of the sun. While their juice isn’t as sour as a traditional lemon, they have a brightness and a buttery richness that neither oranges nor lemons alone can offer. And they’re practically sweet. They are my weakness. There are so many recipes available on the interwebs. I find it’s a waste of my precious time to do what someone else has already done by compiling a list of all those I find interesting. Instead, I’ll point you to some of those lists and tell you what I have and will be making. Meyer Lemon Tart from Simply Recipes (not specifically for Meyers, but outstanding prepared with them). I’ll also be freezing plenty of lemon water cubes to reserve for the summer, making Limoncello by soaking a few lemons in some vodka, soaking a few lemons in some olive oil, and may consider pickling a half-dozen. Yes, I am that in love with these lovely and charming fruits that preserving is the best way to use them up. Lastly,the peel and zest that’s left over gets saved for tea blends. Want some more ideas? Here’s 100 Things to do with a Meyer Lemon via the L.A. Times; Becks & Posh has put together a great little list of their faves too. And here is my “go-to” recipe list any time I’m ready for something new, thanks to buffchickpea. Do I feel guilty for splurging on several dozen of these golden beauties once a year? Not really. I believe I do pretty well the rest of the year trying to eat first homegrown and locally, then regionally, and for special occasions purchase ‘Grown in the U.S.’, and limit the amount of otherwise imported foodstuffs only to appease the Foodie deep inside me. You can also find Jennifer at Unearthing this Life where she blargs about living in rural Tennessee chasing chickens, a seven-year old, and dreams. Here at Chiot’s Run the seed ordering time has begun. I always wait until after the New Year. I sit down with my seed collection, plan out what I want to grow, look through my seeds and order what I need. I also order a few things that look interesting to me. I enjoy growing my own food, but I also enjoy growing new and interesting things. I have the luxury of not needing to grow everything I eat, which allows me the wonder of trying new things. Sometimes they turn out beautifully like the strawberry popcorn I grew a few years ago, sometimes I’m dissappointed, like the quinoa I tried last year, hopefully the broom corn I grow this year will be fun. Part of the joy of growing for me is the hope that it brings each winter when I sit down and order seeds. Do you grow from seed? What do you enjoy most about it? This morning I had a wonderful and cheerful post planned about one of my favorite January splurges. But then an article near and dear to my heart came to my attention and I thought I’d share it here simply because we focus so much on the impact of food on our lives. Over at MSN this morning, one of the headlines read “Global Food Chain Stretched to the Limit“. Having a child only exacerbates my concerns for the futures of the food chain on our planet. It goes through my mind on a regular basis. How long will we watch developing countries starve, riot, and fight to death before it really starts to affect us? When will we really see the damage here? We got a very small taste of it in 2008. And it’s bound to get worse if we “more developed nations” can’t figure out how to balance science with botany and ecology and the economy. How do we stabilize the job market, with a consumer mindset, in the name of convenience, without trashing the planet? What choices will we have to give up in order to meet the most important of the criteria? I find it ironic that the article states the reasons we, as a nation, haven’t felt a massive price increase is because we consume such large quantities of processed foods. And here we Dabbler’s have been preaching to get back to non-processed foods. Why? To support our local farmers, to grow our own food so we don’t have to purchase from stores or overseas. So that your dollar doesn’t get spent on an aluminum can, a paper wrapper, a billboard, and all those commercials that your children watch during their favorite cartoon. So that your dollar goes back to the farmer that can in turn spend money on better equipment, research, and technology that may in turn, one day, help feed our growing population. Which criteria are most important to you: Brand Name, Convenience, Organics, Local, Fair Trade, Sustainable?